I again was commissioned with a big painting on canvas. 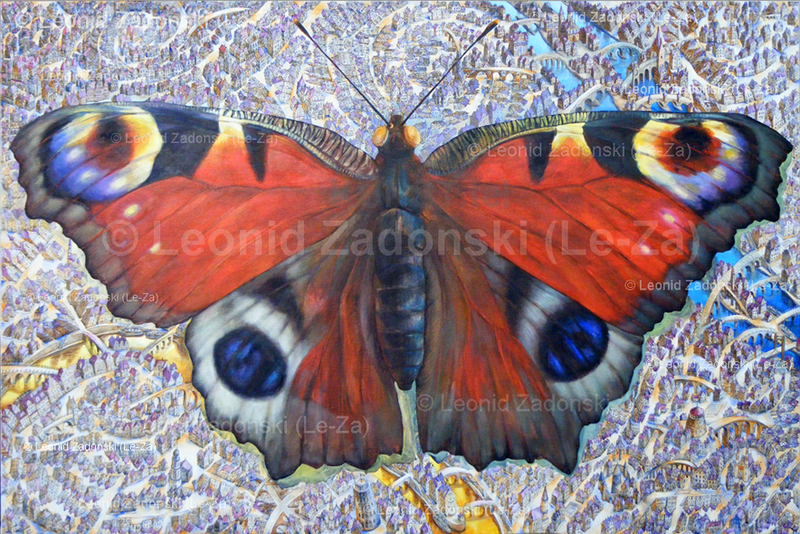 This time the theme of a painting was “Big Butterfly”. I would say it is not easy to find an idea of a painting. 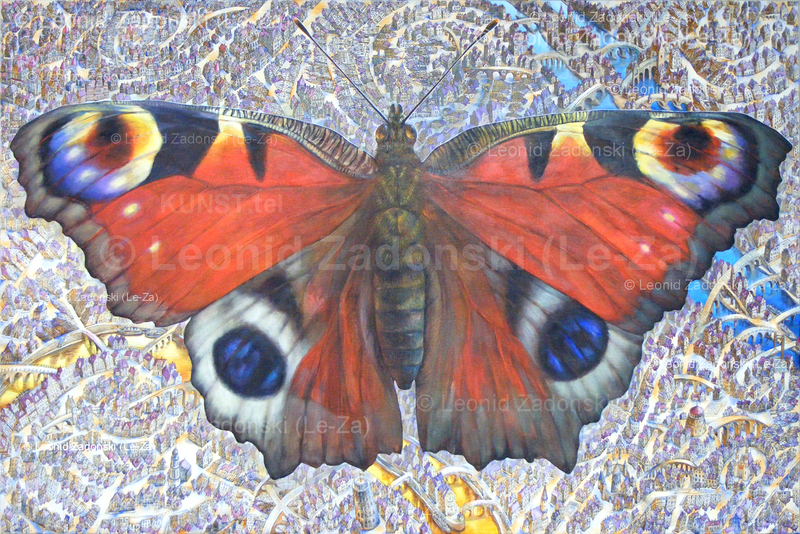 To paint a butterfly is not difficult, but it should be not an ordinary butterfly but especial. So, until the idea of this painting is not fully ripped I “was not sure to begin”. The ready artwork should be made on canvas of 1.0 x 1.5 m with acrylic paints. STAGE 19 The painting is ready. Eyes of the butterfly, as it seems to me, are thinking and mysterious and look like two gleaming ambers with inclusions. I covered it with special vanish and it is finished. STAGE 18. I paint houses and the river in places where it was over-painted with green ribbon when I was painting wings of butterfly. With soft tones I try to make an impression of a light fog, which always coats the objects when we look to them from a distance. STAGE 17. 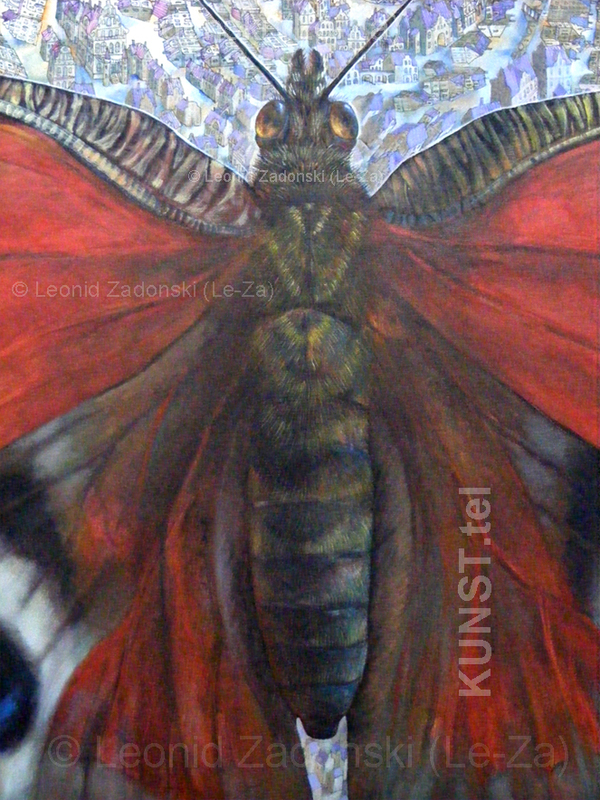 I had painted both wings of the butterfly. Now I will need to make him a face with “thinking” eyes. Also I will put some hairs to his body. Of course, I will add houses in places that now are painted in green. It seems that work with this painting goes to its end. STAGE 16. The left wing of my butterfly is almost done. 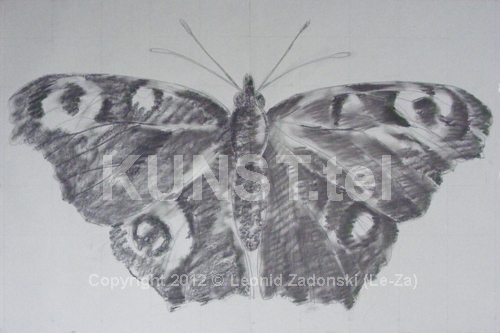 Later I will need to try to get a stronger impression on the wings being of a thin, hard and “dry” quality – as it is usually with butterfly wings. 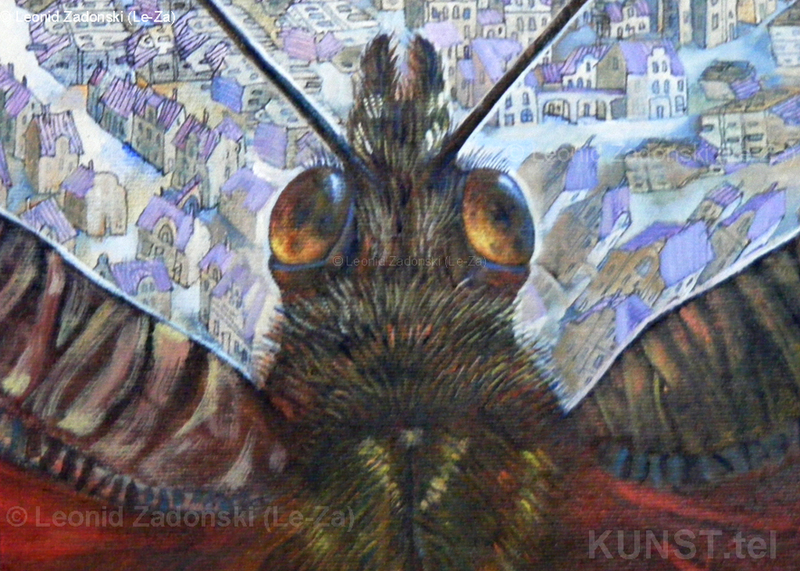 Those parts of the city, which are just at the border with wings, later I will lighten a bit. Then the space should become more visible. Also, I will paint a few more houses at the place where after wing-shaped correction now is a green bar. STAGE 15. Well, the city has already been painted. It seems as if I painted very complicated miniature on the large-large canvas. It could be nice count the number the houses on the canvas. The number of bridges and aqueducts is 32 units. 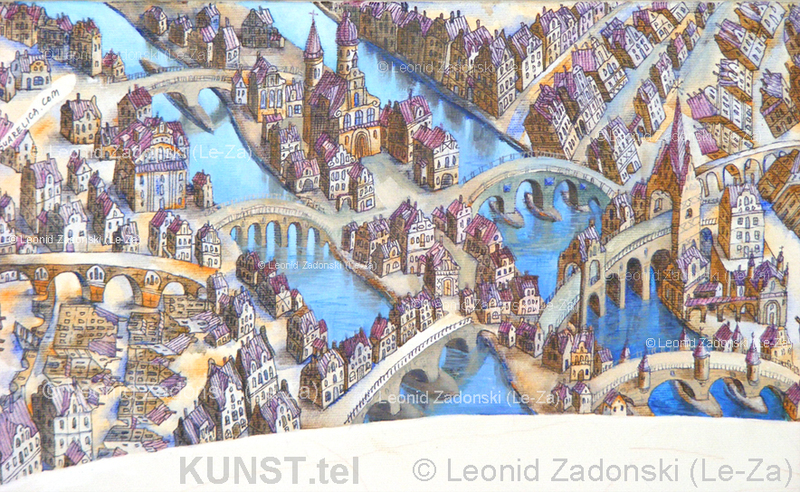 The hardest thing, as it appeared, was to paint reflections of bridges in the water of the rivers. Now I need to paint the butterfly. STAGE 8. Here are lower parts of the city from the right side. 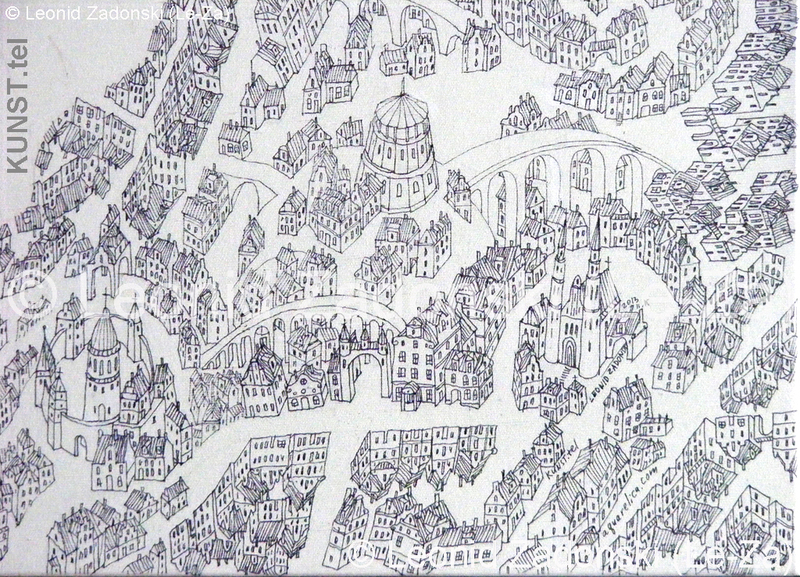 Today, I have finished “building” the city on the canvas. 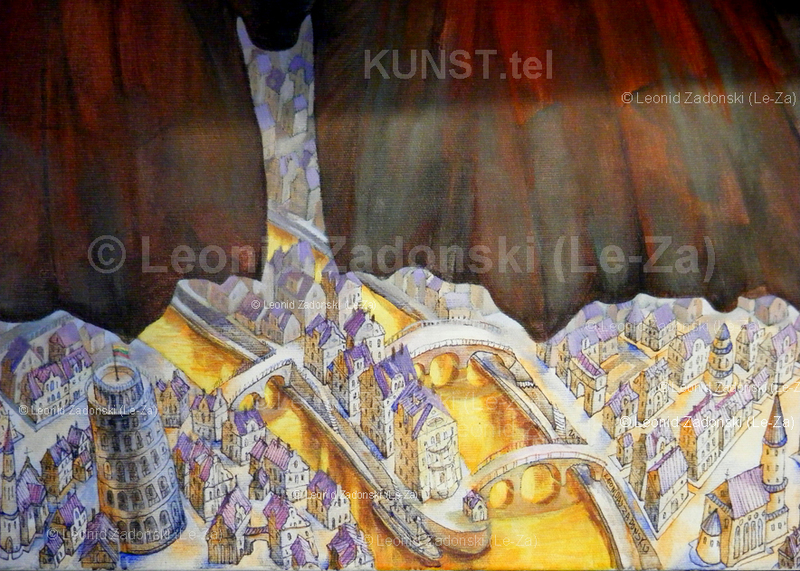 Now I will need with subtle tones of paints to get an illusion that we see the city from the heights. 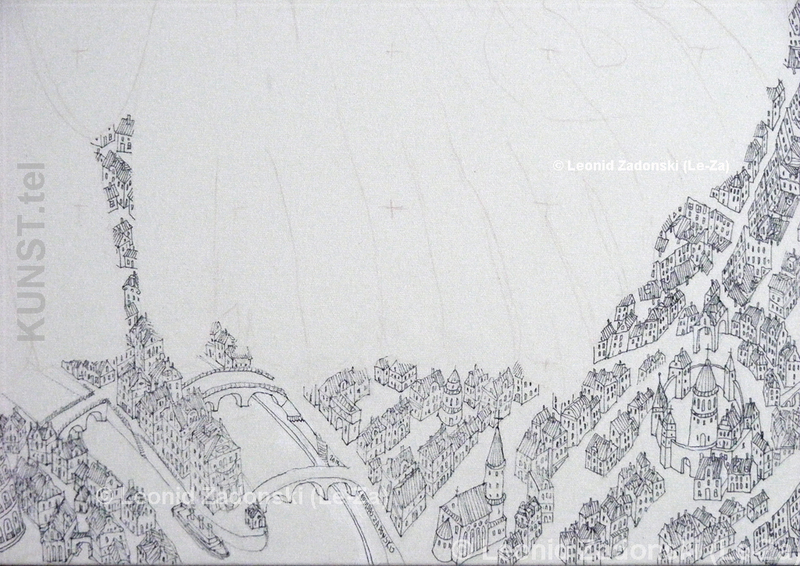 The linear perspective of a drawing I had already made, and now I will need to work with the aerial perspectives and paint distant houses and streets bluer and paler. STAGE 7. 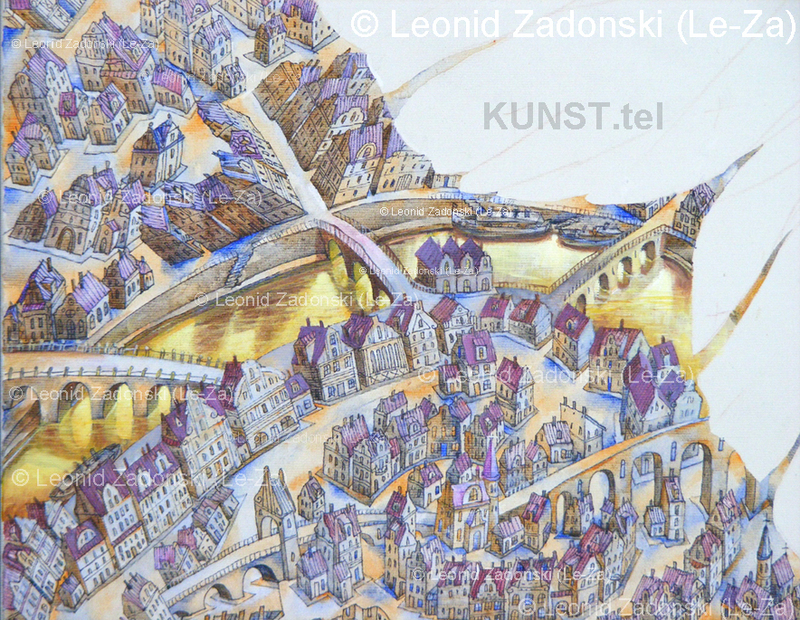 Here the city in the left bottom part of the canvas. I put there a river with few boats and a building, resembling Pisa Tower. Later, with paints, I will try to make the top of the tower looking as to be nearer us. May be this will help to get an impression of the city’s view seeing it from the high sky. STAGE 6. 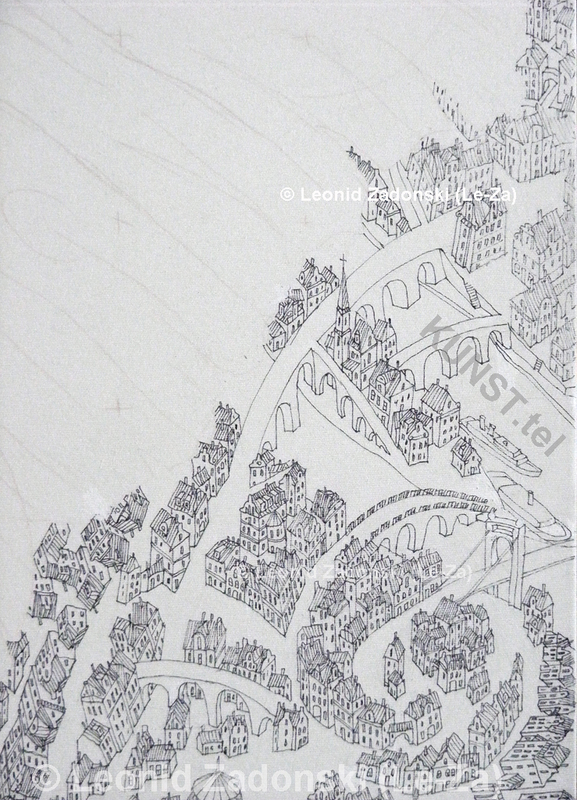 It seems that I finished drawing the part of the city, which is at the top of the canvas. 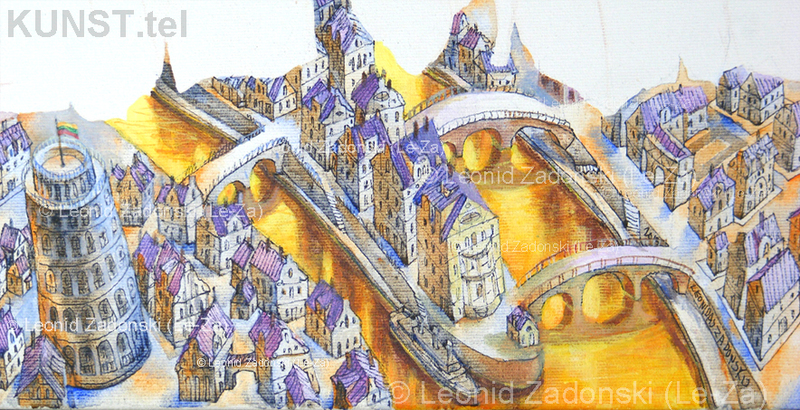 It left to draw the city at the bottom and at the sides of the painting. 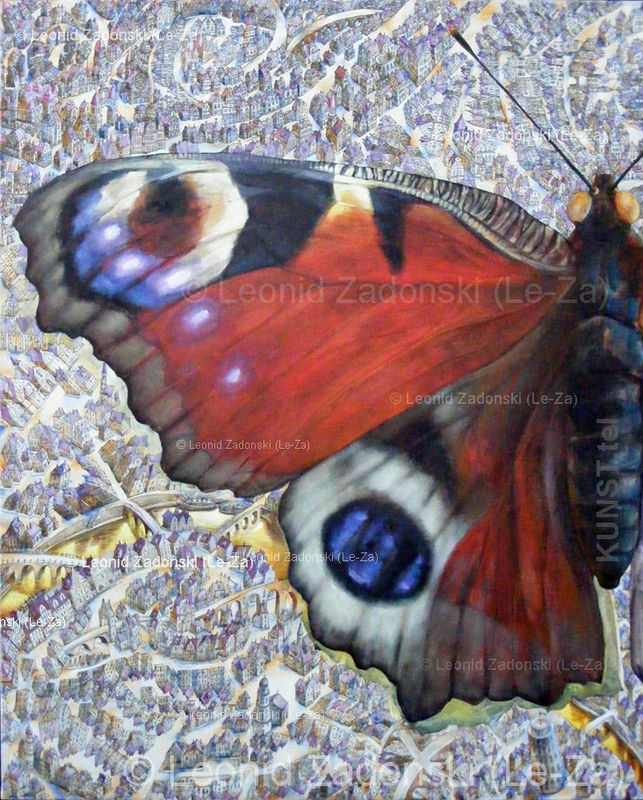 I think that, maybe, I will paint also for myself one more painting with a city’s view from above, but not with one big butterfly but with many smaller butterflies. STAGE 5. I decided to do a river with bridges at the right left corner of the canvas. STAGE 3. 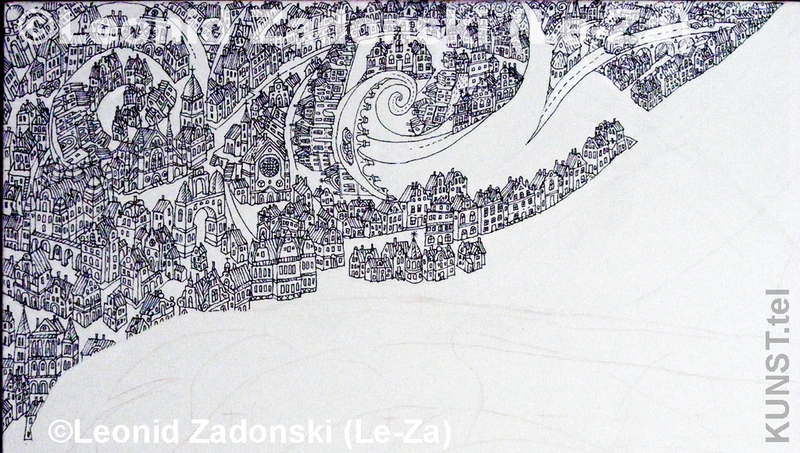 I begin to do a city from the left top corner of the canvas. It seems that there will be a lot of houses. STAGE 2. Today I finished a drawing of future painting, which satisfied me at last. 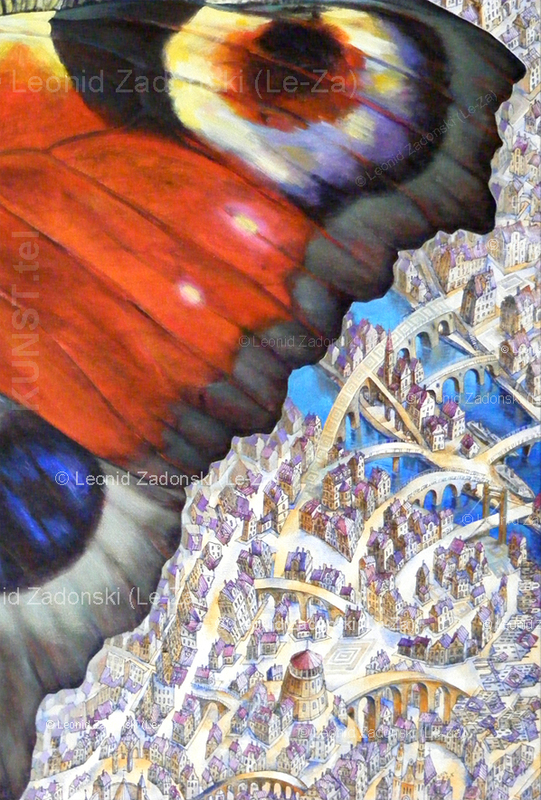 I decided to make a butterfly who flies above the city, and looking on the picture we will see that city how it looks looking on it with eyes of that butterfly who flies high in the sky. I am still thinking about this idea and at present moment it seems very interesting to me. To see our human-build city by the eyes not of another human but with eyes of an insect, who can feel and think completely differently from us, humans. And that painting should be the intersection of two worlds – of the World of the creature and of the World of people. If this idea will seems interesting to me also and in the day of tomorrow, then I will begin this idea painting on canvas. STAGE 1. I took me a lot of time to make this the very first sketch of the future painting. The main time was spent on idea – how to do it. 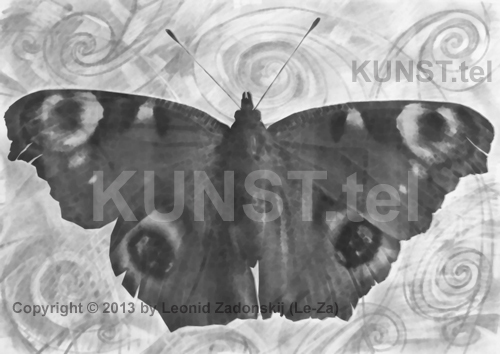 After that I made this charcoal sketch on paper and stopped again. 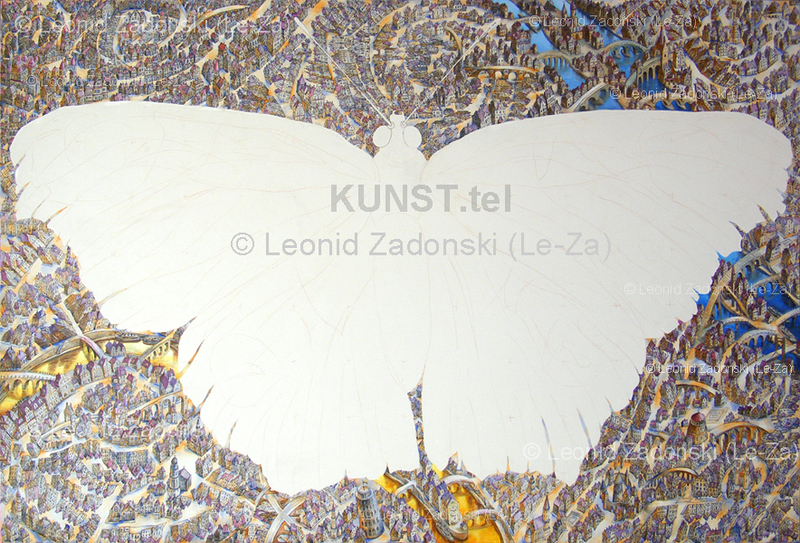 We were talking with a gentleman who had commissioned me this painting, that it will be a butterfly on whose wings will be painted plan of the city with streets and small houses there. Later I tried to imagine in my mind such wings and it began to appear that in this case butterfly will look not enough perfectly. So, the main thing of that long stop was in the primary idea of this painting.